The edit mode allows you to design the scene (which represent a level of your game, or a menu, or any particular screen that should be shown to the user). You put objects on the scene, move, resize and rotate them, and you specify additional properties if needed. 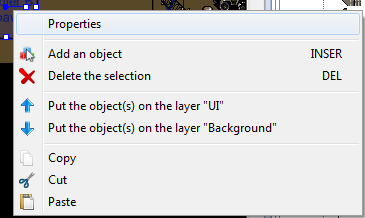 Note that objects can be put on different layers: by default, objects are put on the Base layer. Most objects should live on this layer, but you can add other layers and objects on it using the layer editor. To put an object on the scene, drag it (that means that you click on the object, then move your mouse to the scene while keeping the left button pressed) from the object list of the Object Editor, which is on the right by default. To delete an object, just select it by clicking on it and press the Delete key on your keyboard. To resize an object, click to select it and drag one of the buttons that are around the border. If you keep pressing the SHIFT key while doing it, the ratio width/height of the object will be preserved. You can also rotate an object: drag the button that is near the center of the object. Keep pressing SHIFT to make sure that the angle of the object is a multiple of 45 degrees. Note that you can choose more than one object by holding the Shift key while clicking. The first buttons allow you to open the Objects Editor and the Layer Editor. By default, the Objects Editor is opened on the right. Instances is used to open a list of all objects put on the scene (called instances of objects). You can use it if you need to search for a specific objects that may be hidden by others on the scene. You can Undo and Redo the changes you've made on the scene. You can use the menu below the Undo button to undo a lot of changes. You can toggle a grid. Objects will snap to the grid when moved or resized. Edit the size of the grid using Edit the grid button. The mask button will display a rectangle on the screen, showing the size of the game area. You can update the size of the game window from the projects manager. The last buttons are used to go back to the origin of the scene (the coordinates 0;0). The zoom button is used to change the zoom of the game or go back to the initial zoom (100%). You can also zoom/unzoom in the scene editor using the mouse wheel.